Singer/songwriter Imogen Heap recently is taking a stance to the way in which she wants to sell her music, use her music, and expand her music. Imogen heap is best known for her unique sound and use of musical gloves in recent performances and more importantly an award-winning songwriter and performing who, so far, is the only female artist to have won a Grammy for engineering. After reading an article on The Guardian earlier today I found that Heap, like many artists, is fed up with not being compensated for her work and furthermore not having her work used and listened to as intended. Soon after releasing her album Sparks Heap looked into new ways of releasing her music and came across blockchaining. Blockchaining is broadly used amongst programmers and tech geeks and is used as a peer-to-peer payment system done through a uniquely created database cutting out the extra people involved in a company and instead linking individuals through verifying transactions. In a musical sense, Heap is looking to do this through sharing her music between other artists, film directors, commercial use, and the common music consumer. Through having her music on her own platform, which she calls Mycelia, she can connect one on one with other creators looking to use or branch off of her work. Another benefit to showcasing her work like this is that it also gives the artist more ownership of their work by having simple contracts that state what terms the music would be used to download for. This gives her a record of who is using it for what and a better way to have a latch of her own music. She looks to creating a community of music lovers combined with artists a like to share interest and learn from others work. Heap takes it a step further with making her lyrics, photographs, instruments used, and names of other musicians she’s played with accessible to the public. More and more artists are taking steps like these to ensure they are getting what they want out of their work and ultimately bringing together a group of people who want to work and learn together. At first it has to start with bigger name artists that have a following and once it is recognized globally newer artists can tag along. I personal feel that this also gives other in the industry and fans a better understanding of what that artist is like and see a more personable side to them. As is, that is what we are losing a bit more now a days with streaming. Before you would hear a song, look up the artist, listen to more of their songs, buy their album and fall in love with them. We need that back in order for artists work to be appreciated. Fortunately and unfortunately artists have more power than they think, just ask Taylor Swift. They just need to be the ones to make a stance, broadcast it to their fans, and make that difference in the industry we have been waiting for. If you’d like to hear more about Imogen Heap’s input on the matter along with a team of others in the industry take a look at the video below. 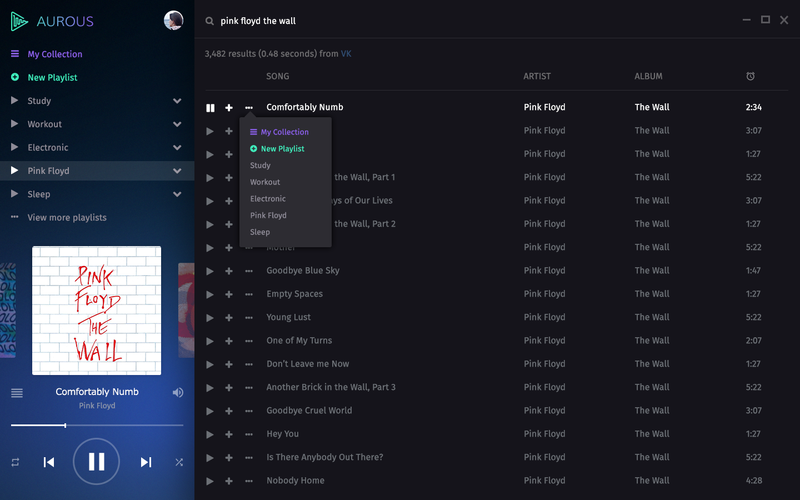 This past Monday Aurous, known as the ‘Popcorn Time for Music’, launched Alpha. This streaming service, like many before it, offers a completely free, on-demand way to listen to music. The biggest attraction to this service is that not only is it ad-free but also allows the user to pull together playlist from multiple platforms whether that is off the internet, Spotify, or from the users own library of music. Creator Andrew Sampsons announces that Aurous has teamed up with ProTip, a tipping services that uses bitcoin’s blockchain technology to pay rights holders so that in this way, users will be able to compensate artists. What seems a bit unclear is whether or not users are forced to pay through listening to a song at a time or are given the option of paying per song. See Aurous layout / interface above. Essentially illegal to most label and artists a like, Sampson points out that there is a portal for rights holders to take their music off the service if they would like. The idea behind this is simple but is it legal? According to reports this morning the RIAA has quickly cracked down on Aurous claiming that this service is not only pulling music from companies that to not negotiate with record labels to have their music played on but also with illegal websites that put up free music illegal such as MP3WithMe and VK. Published today on 20KHZ, the RIAA said quote, “This service is a flagrant example of a business model powered by copyright theft on a massive scale.” Sampson earlier mentioned that his intent was geared for users to take off of ad-supported services such as YouTube or paid streaming services. Although this service seems like a great idea, there are still a clear amount of problems to figure out. Piracy is already a overwhelming problem enough. In my opinion the way in solving this is to make a portion of the website that detects when content is converted from an illegal source that way the company and the user don’t get in trouble pushing the user to legal means of service. By the age of 10, my 13-year-old sister had learned how to burn a collection of some of her favorite songs on a CD. Some of these included 90’s hits by The Goo Goo Dolls, Oasis, The Smashing Pumpkins, later 90’s hits by Brittany Spears, Smash Mouth, Brandy, and early 2000’s songs from Madonna, The Red Hot Chili Peppers, and No Doubt. By the time I was 13, I had my first nano iPod with a combination of 70’s rock hits that my Dad constantly played when I was a kid and newer tunes that came out during that year. Now the latest way to replicate this is by either making your own playlist on iTunes or collaborating on a playlist with friends over Spotify. It wasn’t something I really thought in depth about until reading an article posting on Pitchfork titled “How Playlist Are Curating the Future of Music” by Marc Hogan. This article highlights the importance playlist have played on how people listen to music now a days. Streaming and downloads are two of the biggest ways consumers listening to tunes. Besides the radio, people tend to find out about new music through two very specific resources; 1) by listening to suggested tunes from either friends or something they look up to on music choices like DJs and 2) Using apps or searching playlists that make categories based upon feelings, moods or an activity. Like I mentioned early, the beauty of consumer created playlist is that it still values older music yet gives the creator the freedom they want to mix around tunes without having to listen to only one album by a certain artist. Another major importance this brings to the table is how companies can cater to their consumers with customized playlists to fit every action they take on in a given day. As simplistic as it sounds, it takes hours upon hours of experience and cultured music lovers to make these playlists as well as study their users everyday listening patterns. Some people have even gained huge followings from putting together playlists as a side hobby on sites such as Spotify, and Mixcloud. The negative side effect of moving to playlist based listening habits is that it is harder for listeners to gain stronger connections with individual artists. On the upside, many unknown artist now have the chance to be heard. In the past Lorde and Hozier were found on, Napster co-founder, Sean Parker’s Hipster International playlist at the start of their careers, and even more recently, OMI’s song “Cheerleader” surfaced after appearing on Spotify playlists across the board earning him the #1 spot on U.S. Hot 100 charts. If playlist continuing to become the way in which we listen to music, the industry must find a way to help artists, new and old, gain individual value through the use of playlists while still allowing customers to have a more hands on approach to the songs they listen to.